Foolow village is a pretty and very traditional limestone village with many beautiful walks. In the centre of the village you will find the duck pond, where you can sit and watch the world go by and, watch the ducks sunning themselves. The Bulls Head is the epitome of the English country pub, with an excellent restaurant, open fires, good ale. Just up the road is the Barrell at Bretton with stunning views down towards Foolow. Haddon Hall is one of the finest mediaeval manor houses currently in existence in England. It has a stunning banqueting hall and tapestry belonging to Henry VIII. 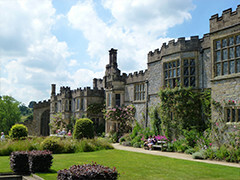 Haddon Hall has terraced rose gardens dating from the 12th Century and overlooks the River Wye. It is often used for costume dramas. Chatsworth House and Gardens is the ancestral home of the Duke and Duchess of Devonshire and has been the family home for over 350 years. 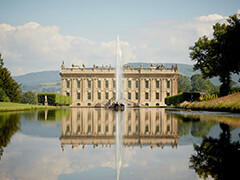 It is known as the “Palace of the Peak” and is one of Britain’s most popular stately homes. The gardens and park were designed by one of England’s most famous landscape architects of all time, “Capability” Brown and his vision has provided some of the most stunning and magical views of all time. There is a fabulous maze, which children love running around. The house contains one of the finest private art collections. There is a children’s farm containing all kinds of animals with animal handling sessions. They can watch cows be milked and has one of the best adventure playgrounds around. Tissington in Derbyshire is a well managed estate village which has an ideal blend of duck pond, trees, cottages, church, tearooms and an old hall. 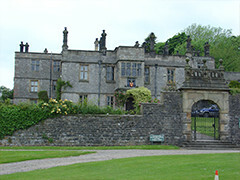 Tissington Hall is a large and very fine Jacobean mansion and home for the Fitzherbert family for almost 500 years. The house was built in 1609 for Francis Fitzherbert possibly incorporating parts of an earlier hall. There is candle workshop in Tissington where you will also be able to wander into the shop/showroom and browse through the collections of wax artefacts which include custom scented candles (we have at least 12 unique fragrances), hurricane lamps, garden candles, wax bowls and is well worth a visit. If its sports you are after, this is a place to visit. 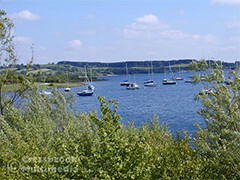 There is canoeing, sailing dinghies, sailboards and cycle hire. Tuition is available for the water sports and cycle hire also. There is a visitor’s centre, restaurant, shops and a children’s indoor and outdoor play area. You can take a tram ride through time and step aboard a vintage tram where you will be taken back in time along a recreated village street complete with working pub. 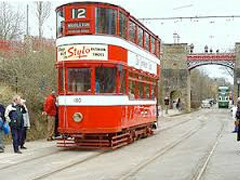 There are exhibitions and can watch trams being restored from the Workshop Viewing Gallery. Children’s playground, tea-rooms, shops and woodland walk and sculpture trail. 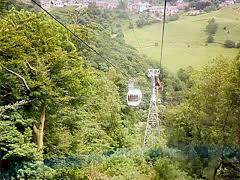 Cable car rides across the Derwent Valley to the 60 metre summit (there is a footpath walk to the top). 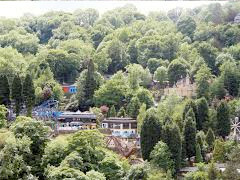 Once at the top, there are stunning views of the Peak District, 60 acres of woodland hillside to explore, a children’s play, restaurant and picnic area. There are two show caverns where you can take a guided underground tour. Monsal Head, only a mile from Brosterfield Farm is a famous beauty spot with a magnificent view down Monsal Dale and the Wye valley and excellent walking. 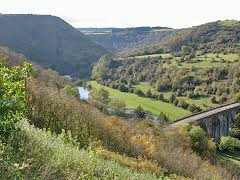 The route of the former Midland Railway makes its way along Monsal Dale and is carried by a viaduct over the river and into a tunnel which goes right beneath Monsal Head. This is now part of the Monsal Trail, a popular route with walkers. The viaduct is now an accepted feature of the landscape. There is a cafe at Monsal Head. A great day out with the children. It has the following attractions: log flume, elephant ride, flight of fantasy, dodgems, chairlift, jumping star, Gulliver’s Magical Journey, Crazy Barrels, The Rio Grande Railroad, the Veteran Cars, Ferris Wheel and much much more. Buxton Spa Town has been a popular resort for tourists for centuries. Based at the heart of the Peak District in the county of Derbyshire, England and blessed with stunning scenery, magnificent architecture, a wealth of shops, and a thriving arts scene. 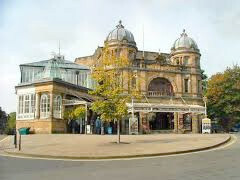 Coupled with its world-famous spa water, Buxton has plenty to offer any visitor. There is a splendid Crescent, ornamental gardens, an Opera House and the largest unsupported dome in the country. The Opera House is host to the annual Buxton Festival, and a number of venues around the town contribute to the largest Festival Fringe in England. Situated just over a thousand feet up in the Derbyshire hills, Buxton’s also the ideal base for climbing, caving, mountain biking, walking, bird watching, horse riding, gliding and much much more. 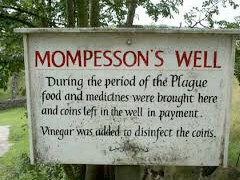 Eyam is one of the best-preserved villages in the vicinity and is the famous 'plague village', which went into voluntary quarantine when the plague was imported from London in 1665. The church in the centre of the village has a small exhibition about the Plague. There are many beautiful old houses in Eyam and parts of the village have been kept as they looked several centuries ago, especially the area at Townend, around the Miner's Arms. Many of the buildings also have plaques giving details of their history and the part their inhabitants played in the Plague saga, it is worth having a wander around the village. Eyam has a number of tearooms and a well dressing and carnival in August. Eyam Hall has been in the Wright’s family for over 300 years. The house is a fine example of an unspoilt Jacobean mansion with delightful gardens, which have retained their layout since the 17th century. The farm buildings have been converted into a working craft centre with a shop and a licensed restaurant. It is open all year. This unique outdoor heated swimming pool is set in a lawned enclosure with a covered veranda to one side. 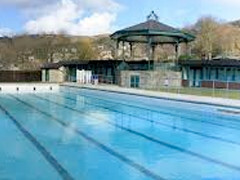 You can swim amidst the glorious Peak District scenery and in beautiful warm water, which is heated to 84°F / 29°C. The changing cubicles and hot showers have recently been refurbished. For opening times please look at the website. Upon seeing Brosterfield Farm we immediately fell in love with it and realised it was a very special place. We knew that we wanted to create a wonderful family home with high quality accommodation for guests to come and stay and enjoy everything the Peak National Park has to offer. Over the next two years (and many sleepless nights), we have carefully and lovingly restored the farm, the stables and small barn into a beautiful home and a luxury getaway for guests. Copyright © Brosterfield Farm Peak District Holiday Cottages.